In celebration of the 25th anniversary of its launch in 1990, the Hubble Space Telescope has been used to give us a new take on one of its early classic images – the “Pillars of Creation”. Seems like only yesterday when we saw those first pictures sent back to Earth and it became apparent something was seriously wrong with the optics. Fixed three years later with the installation of a special optical system during a servicing mission by space shuttle astronauts, Hubble has taken some amazing and beautiful images. One of the early classic images was the so-called “Pillars of Creation”, a section of the star-forming region within the Eagle Nebula (Messier 16) imaged in 1995. This is a cloud of dense gas and dust eroded by the ultraviolet light of hot young stars, creating amazing dark pillars, five light years high. Within the pillars new stars are being born. 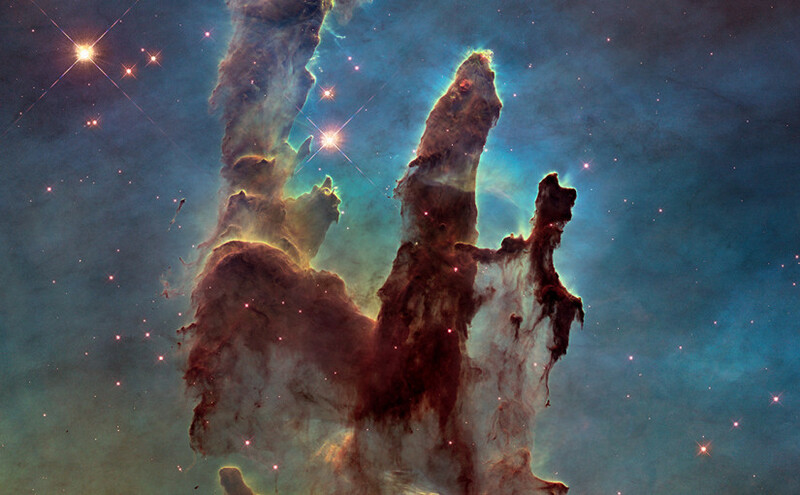 Now, as part of its 25th anniversary, Hubble scientists have revisited the Eagle Nebula and produced two gorgeous new, high-resolution images of the Pillars using the Wide Field Camera 3. One of these images is taken in visible light, similar to the original Pillars image, the other in near-infrared. The infrared light shows us a different view, letting us see through much of the gas and dust, revealing stars in the background and deep within the dense pillars. The best way of showing off the differences between these two images is to overlay them and blink between the two. With a bit of judicious rescaling and alignment, I’ve created this animated gif (click on the image below) which illustrates quite clearly why a multi-wavelength view can pay dividends in providing new information. 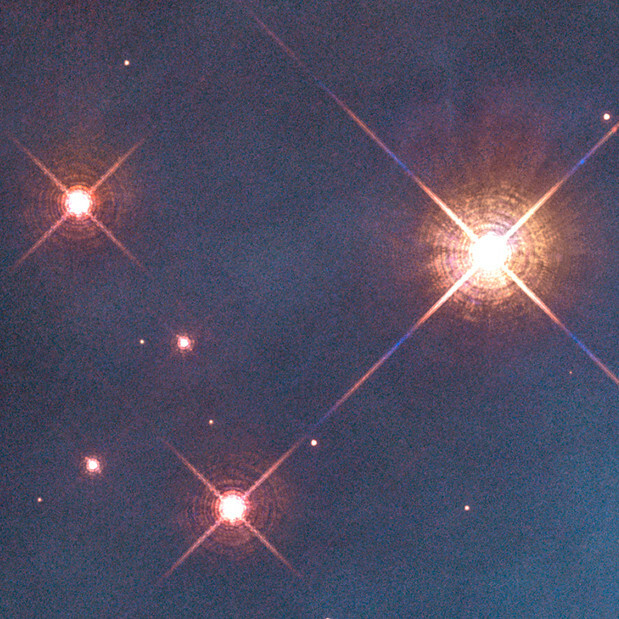 As an added bonus, physics fans might like the diffraction patterns visible in the bright star images. A zoomed in view of the group of three stars towards the top reveals the concentric pattern of rings surrounding the bright central Airy Disc, produced by diffraction of a point source through a circular aperture. Superimposed on this are the diagonal crosses of diffraction spikes due to secondary mirror supports in the telescope. This diffraction-limited imaging is made possible by flying the telescope above the blurring effects of the atmosphere enabling Hubble to produce such stunning images over the last 25 years. Three bright stars (point sources) in the Pillars of Creation image showing diffraction effects.